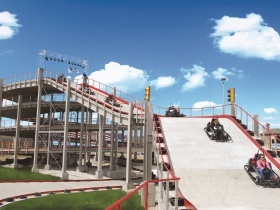 At The Track Family Fun Parks in Branson, Missouri you’ll discover fun and excitement at every turn...whether you’re taking a turn on a high rise go-kart track, or twisting and turning through the Laser Maze Challenge, it’s definitely your turn to have a sensational time in Branson! If tons of twisting metal and concrete is your thing, hop on the Heavy Metal High Rise for 4 stories of fascinating go-kart fun! Maybe a whopping big wooden track gets your motor running; then climb in a go-kart on the huge Wild Woody, or maybe Branson, Missouri’s original wooden high-rise track, the Lumberjack! Does the whole family want to ride at the same time? The Road Course Track delivers tight, higher banked curves than a traditional track, and it’s a long track, which means it can handle more karts. At The Track, you’ll find a go-kart adventure for every taste! Love mini-golf? It’s golf galore at The Track, including the brand new Route 76 Glow Golf, a custom-designed 9-hole black light delight that takes you through mainstay sights found only in Branson. If we haven’t talked about enough amazing stuff yet, how about rides just for the kids? The newly re-energized Laser Tag...or the bumper rides...maybe the arcade games...the 100-foot-tall Skycoaster? The Track Family Fun Parks even lets you sharpen your skills at America’s favorite past-time...they’ve got batting cages! Make sure you don’t miss the newest things to do at The Track, like dodging the lasers or running right through them at the Laser Maze Challenge, or putting your way through Glow Golf. Whether you come on in for the new stuff, or for everyone’s tried-and-true favorites, there’s no shortage of thrills at Branson, Missouri’s Track! With four fabulous locations in the heart of Branson, every member of the family is sure to find all the excitement they can handle! There’s never a dull moment when you’re at The Track Family Fun Parks...it’s pure phenomenal fun for everyone! Find out more about what Branson, Missouri has to offer with Branson.com.